I gave Western Digital’s original WD HD Media Player a glowing review, describing it as a ‘kitchen sink an all’ media player that just works. As readers may remember, the set-top box does away with local networking or an Internet connection, instead featuring two USB ports only, to offer a near fool-proof way of watching almost any video downloaded from the Internet on the TV. 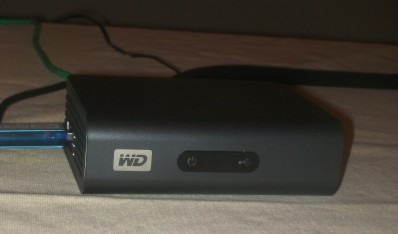 However, the lack of network connectivity, a potential shortcoming for some, has been addressed with the newly released WD TV Live HD, which adds an Ethernet port and support for YouTube and Flickr, Internet radio from Live365 and Pandora (US version only), along with content stored on a Windows PC or Mac on the same local network. Like it’s predecessor, the device is being marketed based on HD video support (up to 1080p), and this, explained a company rep at a recent press event, is the reason why a wired connection was chosen over WiFi. Since many home wireless networks don’t stream High Def video reliably, Western Digital didn’t want to mislead customers. The company does, however, provide a list of compatible WiFi adapters – unofficially supported – for those who still wish to go down the wireless route. Any word on whether the WD TV Live will still work with YouTube after December 2? Lifehacker reported that YouTube is cutting off access from many set-top boxes.